Check out our full review of the Hidden Radio bluetooth speaker. Last year we got our first glimpse of the HiddenRadio wireless speaker, now it looks as if we’ll finally be able to hear it. Once a Kickstarter project, the HiddenRadio is now produced and ready to covertly cover your home with your favorite tunes. This little speaker sports some pretty slick design twists. Twist top of the HiddenRadio, and the device turns on. Keep twisting the cap and it gets louder, making this one of the more intuitive wireless speakers on the market today. The HiddenRadio features a tacky rubber underside that is meant to help it stay in place. Then again, depending on the type of surface it is set on, it could just end up getting tipped over and go rolling out of view, possibly as a way to hide – that’s probably not what the designers had in mind, though. What is actually “hidden” on the HiddenRadio speaker is its control layout, which includes a single three-way switch that lets you decide to stream music from Bluetooth, select the aux input or tune into FM radio. Two additional buttons provide the tuning. As noted, there is no volume control. If you want more sound, you just open it up further. To quiet things down, close it up. As intuitive and nifty as this may seem, there is a purpose for real volume controls and we wonder if this approach might not be so conducive to good sound quality. 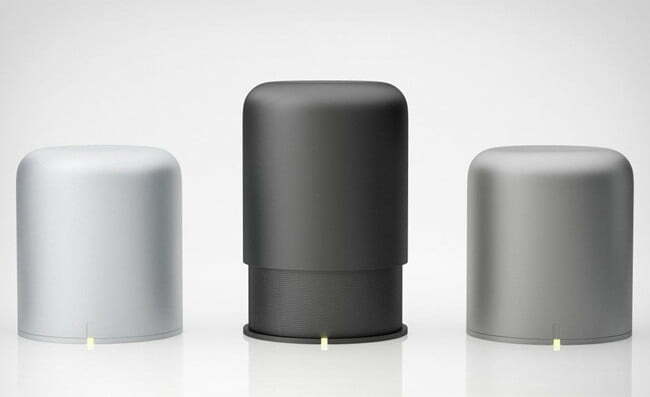 However, the designers promise that the HiddenRadio portable speaker can provide 360 degrees of sound from its unique driver and conical design. Moreover, this compact USB-chargeable device is small enough to be carried around and can provide that “anywhere sound” for up to 15 hours – down from the estimated 30 hours the designers had hoped for back in the Kickstarter days. You can get the HiddenRadio speaker in metallic silver, graphite black or pure white for around $150. Microsoft’s Surface Headphones are stylish, comfortable, and have great noise-canceling, but at $350 a pair, they’ll have a hard time matching the industry leaders like Sony and Bose. The market is saturated with wireless audio solutions fit for any and all circumstances. Check out our picks for the best Bluetooth speakers available, whether you'll be listening in the kitchen or on a mountaintop. With sleek forms, prime audio quality, and the freedom of untethered listening, there has never been a better time to pick up a pair of wireless headphones. These are the best ones currently available. To compete in the smart speaker space, Sonos could have just made a better-sounding Alexa speaker. But the company has a reputation to uphold, and went much further. Our Sonos One Review reveals how Sonos does Alexa better than Amazon. Everybody wants a bargain, and this list has a bunch. For those looking for a solid set of headphones without spending a big stack of cash, this list is is your starting point. Check out our picks for the best headphones under $100. You no longer have to sacrifice sound for size when selecting home audio equipment. Check out our picks for the best soundbars, whether you're looking for budget options, pure power, smarts, or tons of features. With the new Powerbeats Pro grabbing headlines, it’s worth taking a look back at Beats’ previous flagship wireless earbuds. Do these popular, bass-happy workout buds still deserve your consideration? If you can't stand the tangle of cords, or you're just excited about completely wireless earbuds, you're going to need some help separating the wheat from the chaff. Our list serves up the best true wireless earbuds around. A report that is decidedly light on details, suggests that Apple could introduce its next generation of fully-wireless earbuds as early as the end of 2019, with noise cancellation as its key feature. Amazon knocked $220 off the price of two Bose 301-V Direct/Reflecting bookshelf loudspeakers, a 50% discount. The 301-Vs are suited for music or for home theater systems. Amazon's sale also includes the Bose Solo 5 TV Sound System. Our complete list of what's new on Netflix for May 2019 and which titles will be removed will help you catch up on your bingeing, and also ensure you don't miss any titles heading into the streaming ether. Get ready to simplify your home. Our top choices for the best universal remotes let you easily control your Blu-ray player, DVR, TV, A/V receiver, or any other device you may have tucked in your media hub.